Ax 2009 came with many changes regarding addresses and contacts. 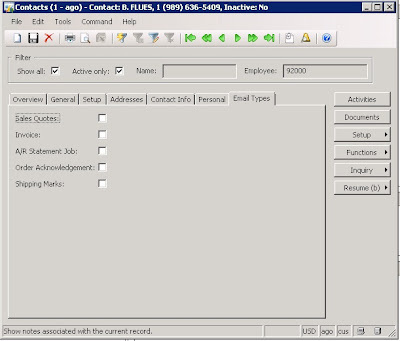 Now the GAB (Global Address Book) allows you to have a centralized repository of contacts (person and/or organizations), these can be used in many different processes such as Business Relations, Leads, Sales Orders, ect. Because of this, I came up with an idea to setup a place in the contacts table (and form) where the user can choose to whom send what type of email from Outlook automatically. For example, in our company we send emails to the person that is asking for a quote after a Sales Quotation has been created. The same is true for a Sales Order Acknowledgement. One of the problem that the users were experiencing was that sometimes they have 10 contacts for a Business Relationship, and when creating quotes for this business relationship, more often than not, more than one people at the customer's site wanted to get the quote. This created a lot of manual labor and many mistakes. 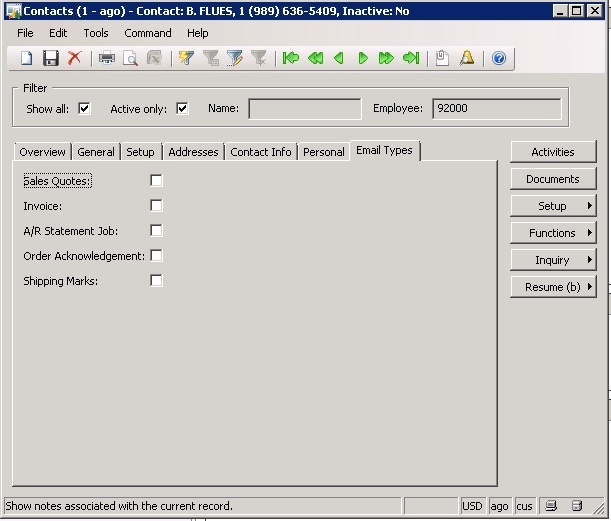 So I added a new tab to the smmContacts in AX2009, and within these Tab I added 5 different check boxes that represent the 5 types of emails we ussually send to customer (contacts) after an operation has been completed. I created a new Enum named EmailTypes that has 5 elements (the same as the ones shown in the picture below). A contact can be assigned either one or all types of emails. At the same time I created a public static method in my static class that I called AGO_Utilities where I store many common functions I use daily. This method uses the DirPartyID to find and return the Email of a contact based on the email type. If we were to have 20 users, the method will loop through all of them until it finds the correct one. Then I change the Quote status to "Sent"
Then I start Outlook and the user gets an Outlook window ready to send an email.